Rohit Shetty directorial film Simmba is doing undoubtedly the best box office collection at the box office. The film is even ready to enter 200 crore club. Last night the makers of Simmba, director Rohit Shetty and producer Karan Johar threw a success party to the team and close ones. Now the pictures from the party are coming out and those all pictures are going viral on social media. In this party, all the actors came in the happiest way and like always Simmba aka Ranveer Singh made an amazing entry. 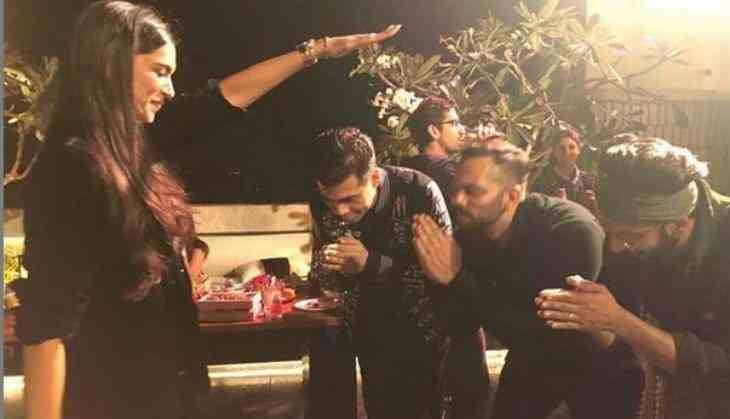 But the most unique thing that happened at the party was Deepika Padukone giving blessings to all three from Simmba team, Karan Johar, Rohit Shetty, and Ranveer Singh. Actually, Rohit Shetty shared a picture on Instagram in which he alongside Ranveer Singh and producer Karan Johar are being seen greeting to Deepika Padukone, while like an elder one Deepika is giving blessings to all of three. This is to notice that Simmba has collected around 190 cores in 10 days and soon the film will enter 200 crore club. While Rohit Shetty is ready with his next venture Sooryavanshi, starring Akshay Kumar to go on floors from 2019.